Are U.S. elections being conducted fairly? Election laws and voting procedures have been a major source of controversy in the United States ever since the stunted recount in Florida that determined the outcome of the 2000 presidential contest. Republicans and Democrats have clashed fiercely in state after state over GOP-backed proposals to require government-approved photo IDs for voters to cast ballots. 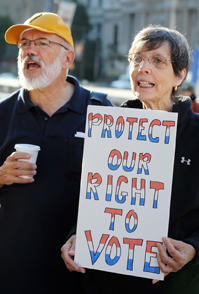 Republicans say the laws prevent fraud; Democrats say the laws are aimed at vote suppression. Court rulings on the laws are mixed. The Supreme Court added to the controversies with a decision in June to disable a major provision of the federal Voting Rights Act that required some states and localities with a history of discrimination to obtain permission from the government before instituting any change in voting procedures. A bill to restore the provision has been introduced in Congress, but no hearings have been scheduled yet. Election officials are also looking at recommendations from a presidential commission for online registration, more early voting and costly replacement of technologically obsolescent voting machinery.